1. 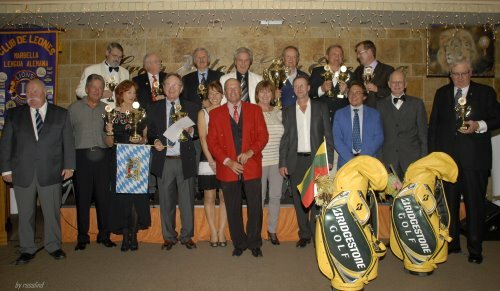 Lions European Golf Championship was a great success! The organizers now have permission to go ahead for the 1.Lions Golf World Championship in March 2015. 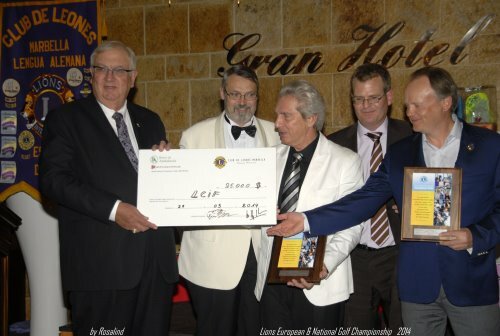 With the presence of the Lions Foundation World President Wayne Madden of America, the Lions celebrated their 1.Lions European Golf Championship from 25 - 29 March on 5 top golf courses ( Alcaidesa Links , Atalaya Old , Marbella Club Resort , San Roque and Finca New Cortesín ). The 60 players from 13 different countries enjoyed the vast variety of golf courses that the Costa del Golf has to offer. The welcome ceremony on Monday and the additional programs were a perfect counterbalance to the tournament. A visit to Puerto Banus with a boat trip to Marbella and a professional guide through the old town. Also Dance parties led by dance instructor Colin + live music during dinner and a visit by the Mayor of Estepona Jose Maria Garcia Urbano It was a fun ending after the 5 days tournament. At the closing gala on Saturday the lucky winners were honored . The 1. Lions European Golf Championship was won by the top Irish player Pam Morgan. The Lions Golf Nation Cup (two players on the team per nation) was taken home by the two players from Lithuania, AurelijusRusteika and DainiusSutavicius. From the Links Course ( Alcaidesa ) for golf in the mountains ( Marbella Club Resort) and a visit to the championship course, San Roque , host of the Spanish Open, playing in the park ( Atalaya Old ) and finally with the crowning of FincaCortesin , experiencing the world- class flair of the Volvo Match Play Championship golf history. The 130 guests and golfers from all over Europe India and America were thrilled. From the world president Wayne Madden, with the country's president of the Spanish Lions , Luis Calderon Dominguez, honors and awards were presented . In addition, Wayne Madden received a check of $ 25,000 which goes to the Lions International Foundation for the eradication of the terrible measles disease worldwide. After a full program, with all facets of what Andalusia has to offer for the golfer , the unanimous opinion of the golf guests was overwhelmingly positive. Next year,every-one wants to come again to play in the 1. Lions Golf World Championship. 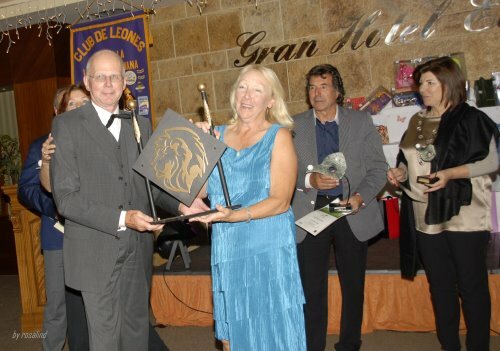 The two Lions Clubs Mijas and Marbella - Lingua Alemana under the direction of Luis Calderon Dominguez and Tobias Heyden, as well as the organizational team Dr. Volker Bernhardt and Angelika Eisinger will immediately start the preparation for this outstanding golf event along the Costa del Golf. 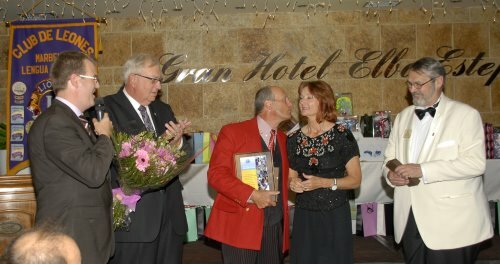 A big thank you goes to the generous sponsors and helpers: Hotel Elba , all participating golf clubs, F1ImmoCarGallery , TopoGrupe , Bang &Olufsen , Organo Gold , Holiday Golf , Mara Creations, Hainzl& Partner, Prof. Dr. Koller, Christa Spänhoff and last but not least, the two singers Susan and JohnnyG with their terrific performances….. in helping to making the tournament so enjoyable & a great success! The lions club looks forward to meeting you all again next year.